The compact size “Happy Hacking Keyboard Professional 2 “is a contact less system keyboard made by PFU, part of the Fujitsu Corporation. This compact size keyboard, with a consistent tactile feel and reliability now supports the USB interface. The Plug-n-Play Professional 2 also has two built in USB ports, which allows you to easily plug additional peripherals into the keyboard ! With the HHK Pro, however, a circular cone spring systems was adopted. This system is based on an electric capacitance system instead of an electrode system. 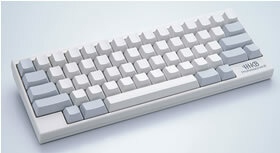 This leads to softer keystrokes and longer keyboard life.The key board is compatible with PC / Mac and connects via USB. Key arrangement [Control] is just left side of [A]. It comes from Sun Type3 key layout and US arrangement 60 keys. By Mode/Dip switch situated on the rear you can choose a mode for PC / Mac and set customizable keys. The keyboard will be available in 2 different colors- white (PD-KB400W) and charcoal black (PD-KB400B) from March 24th for approximately 24,990 Yen ($ 200) .